After a REALLY cold Tuesday morning, a warm-up is coming tomorrow! It was SO cold this morning! Not record cold, but still... brrr! Raleigh started out with a morning temp of 33 degrees and Fayetteville hit 37 degrees for a low. And now, the warmup begins. By Wednesday, the high will be near 80 degrees. That's almost a 50-degree temperature swing in less than 36 hours. Welcome to North Carolina. If you don't like the weather, wait a day, literally. The warm-up doesn't last, however. 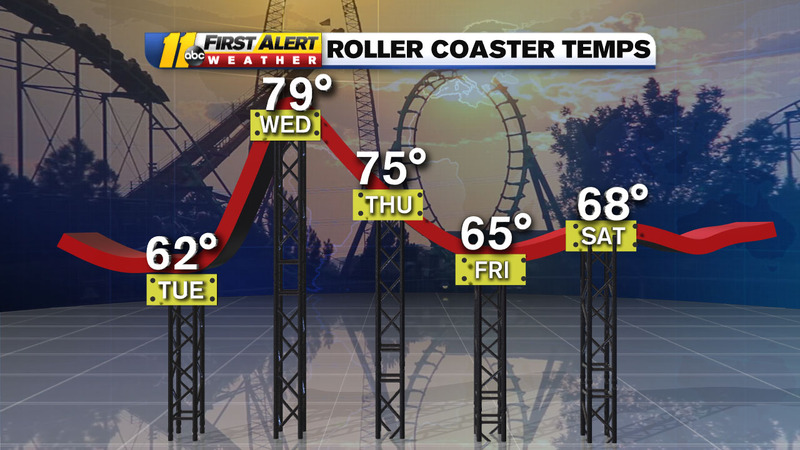 By Friday we see our highs back in the 60s. And we stay below our typical high (73 degrees) all the way into next week. Even though it stays cool, the weekend is shaping up dry for all those springtime plans. The rain doesn't return until Sunday night into Monday.